It happened again. 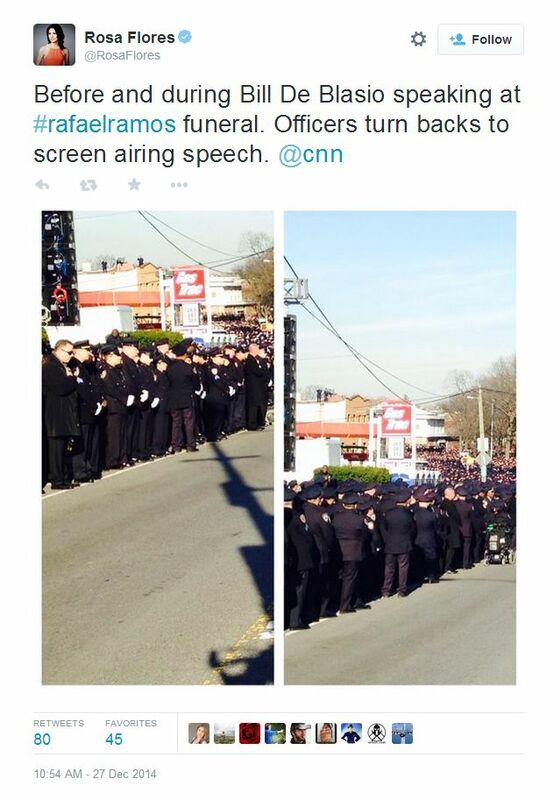 NYPD officers—during the funeral of slain cop Rafael Ramos turned their backs on NYC Mayor Bill de Blasio when he addressed parishioners. The same cops who want anti-police protesters to mute the demonstrations out of respect and mourning for Officer Ramos and his partner Wenjian Liu, decided cops should always have a free pass at disrespect—even during the day that they bury one of their own. This episode should teach Mayor de Blasio two important lessons about plenty of NYC cops and their leaders. People of African descent and others who feel that no one should be targeted for police harassment, and possibly even murder, should have learned similar lessons today as well. The first lesson: the lives of police matter. I can’t argue with that since I believe all lives should matter. The second: the lives of Eric Garner, Sean Bell, Randolph Evans and others who have died like them over the years don’t matter nearly as much, if at all. No collective police mourning period for civilians who are shot for showing a wallet, choked to death after being accused of selling loose cigarettes, or suffer a similar fate for playing street football. And those are only the deaths we’re aware of. The only thing that matters to many cops are cops. Not a good formula for civil servants who took an oath to protect others. This entry was posted in Politics, Race, Society and tagged Bill De Blasio, chokeholds, nypd, police brutality, police shootings, Racial Profiling, rafael ramos, wenjian liu. Bookmark the permalink.